The BoBunny Blog: Mix it Up! With Bo Bunny and Scor-Pal! Mix it Up! With Bo Bunny and Scor-Pal! If you have been visiting the blog this week you will know that Bo Bunny have teamed up with Scor-Pal for a 4 day blog hop between our two blogs! Scor-Pal very generously sent each of our designers a Scor-Buddy to work with and the design team has been making lots of beautiful projects with them!. The Scor-Pal is an amazing and versatile scoring tool that simplifies paper folding for such crafts as card making and scrapbooking. Today's Bo Bunny post is one of our regulars, Mix It Up with the addition of the Scor-Buddy! We have some gorgeous inspiration for you today so let's get to it! First up we have Luzma with this super cute layout mixing the fun Sweet Tooth and Smoochable ranges! 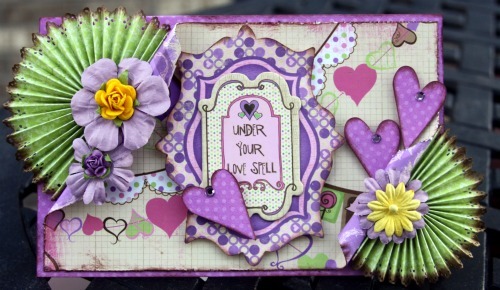 Next up we have Debbie who has done a gorgeous wall hanging mixing up Forever Fall and Garden Girl and a fantastic card mixing up Smoochable and Vickie B! Patterned Paper - Smoochable/ Loving You ; Vickie B/Vickie B. We hope that you have been inspired by the various projects created by the Bo Bunny designers today! 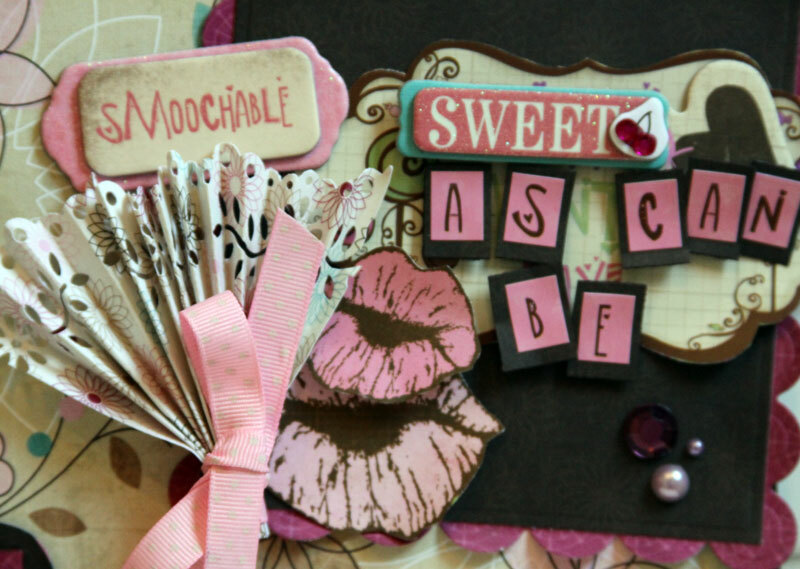 Don't forget to stop by the Scor-Pal blog next and check out their creations! We guarantee that more inspiration awaits you!!! OK, now, who would LOVE to win a prize?! If you answered yes, then make sure you leave a comment here and then hop over to the Scor-Pal blog and leave a comment there. We will be sharing projects for this blog hop on both blogs until Friday, November 4th. Bo Bunny and Scor-Pal will each be selecting one winner from all the comments left for a fabulous prize package! So the more times you leave a comment, the more chances you have of winning! Good luck and thanks for hopping by!!! Love the wall hanging and tower of ice cream! And the card is cute. I love the apple wall hanging. All 3 projects are lovely. Absolutely stunning. I am blown away by the talent I see on this blog every time I visit. 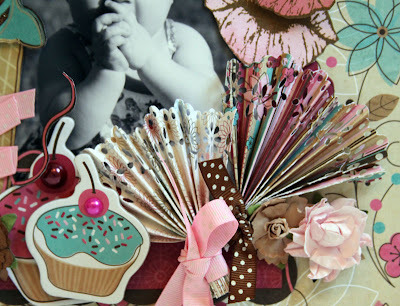 Love all the accordion fold rosettes and fans. Thanks for the chance to win a fabby prize. I love the projects! Accordion folds are just so fabulous looking! All projects are so beautiful! What fantastic projects! Thanks for the inspiration. awesome projects today! I love the wall hanging, my favorite! I love that wall hanging! So in-love with the gorgeous Welcome wreath!!! Pretty projects-especially loving that last card! Love the wall hanging! Can't wait to try it! LOVE the little fans on the layout! Such a great idea - as always the projects are gorgeous! Love the ideas and inspirations! And thanks for the opportunity to win some great prizes! Oh I love the fans. What a great addition to any page! 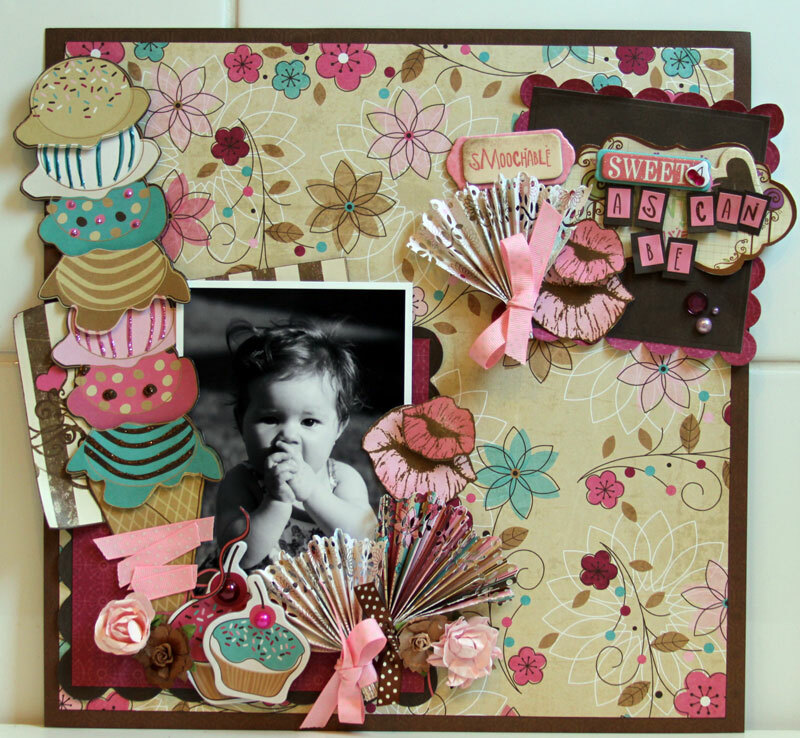 The 'Sweet as can be' layout is such a wonderful idea for a little girl - and actually having the whole page to theme not just a title! 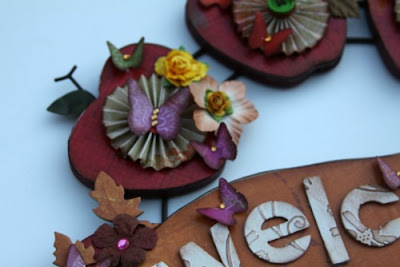 I love the welcome wall hanging...beautiful rosettes in such a lovely warm colour. All of them are great projects with lots of inspiration but I'm blown away by that super sweet and yummy scrapbook layout. FABULOUS! 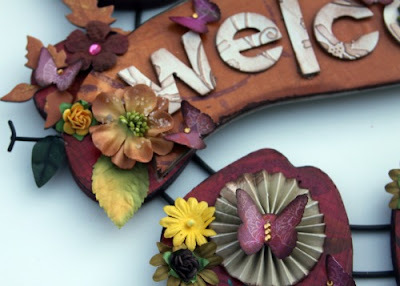 That welcome wall hanging is wonderful! Thanks! Wonderful projects, love the dimension added by the fan and rosettes. The papers are beatuifully patterned and colored. Thank you fo rsharing and a chance to win. Love the projects, especially the layout. Going to have to try and make these flowers. Becoming very popluar on projects! TFS. wow, fabulous creations, what a perfect combination, Bo Bunny and Scor Pal! Amazing! I love these projects. The layout is absolutely gorgeous! Fabulous projects! Thanks so much for sharing! Thanks again for some great inspiration, love the projects! Love the projects! Keep the inspiration coming! Awesome projects! Designers, you rock! All of the projects were awesome. Love the apple wall hanging. TFS and the chance to win. I love that apple wall hanging and how great it would look in my kitchen. The other projects were great also. Thanks for the chance to win. Gorgeous!! Thanks for the inspiration! And another fantastic set of ideas! The wall hanging - WOW - I'm at a loss for words. Loving the projects you made. Loving all the projects - the Sweet Tooth layout is just precious! I love all the different ways you can use this tool from cards too scrapbook layouts. Thanks again for all the inspiration. WOW - amazing projects. Love the little fan flowers! Love the projects today especially the Welcome Wall Hanging. Great job to all. Gorgeous projects! I love the wall hanging - adorable! Thanks for the chance to win! I love the fantastic projects!! The fans and flowers are adorable!! Love these! The 1/2 rosettes are so so cute! I love these projects. So creative. These are all great projects!! Love the half rosettes. and I always love all the beautiful layering - it inspires me!!! 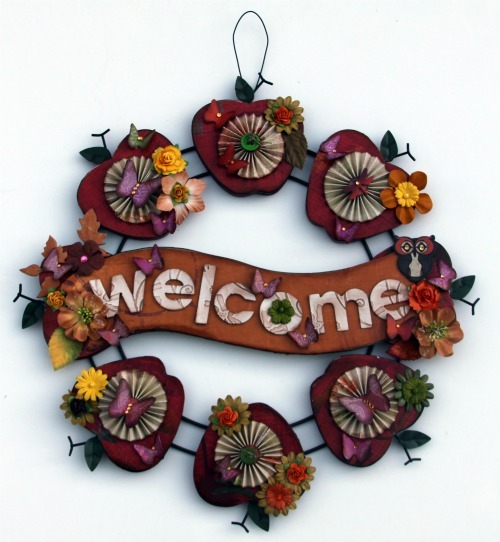 i especially love the welcome wreath!! wowwww! all great projects! These are all so gorgeous!! Luzma's ice cream cone is beautiful, and so is that precious pic! Every single project is wonderful but i especially love the Apple wall hanging! Sooooooo lovely! I love the Apple Wall Hanging.Thanks for a chance to win. 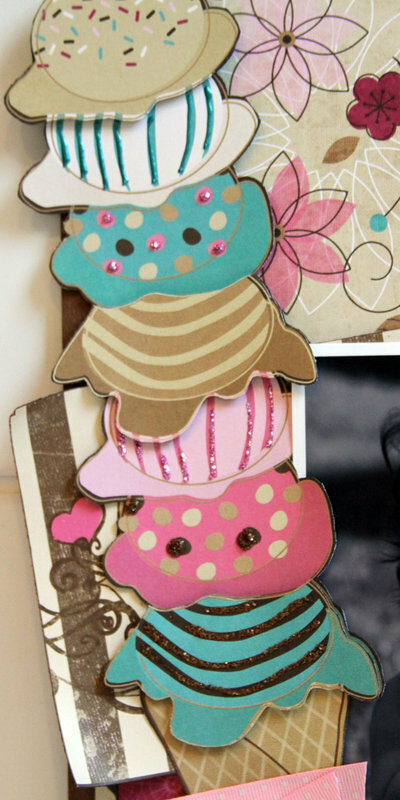 Wonderful work, I love the ice cream cone embellishment! Fab projects - wonderful inspiration! Beautiful projects!! !And thanks for the opportunity to win some great prizes! So cute, love that huge ice cream cone and the apple wreath! Great projects! Beautiful projects yet again! 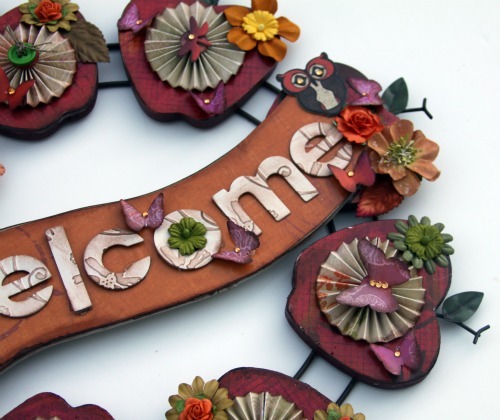 I especially like the Welcome wall hanging. The apple wall hanging is breathtaking! I love the fan idea! omgosh I LOVE the ice cream layout!!! too dang cute!! Those fans are so cute and would be great on a Valentines project! Great projects--love the rosettes and fans.